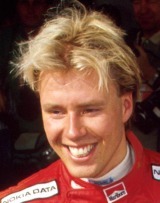 Great success was forecast for JJ (real name Jyrki Jarvilehto) who had won the European, Scandinavian and Finnish Formula Ford 1600 titles by 1986. When he came to Britain in 1987 he dominated the national and European Formula Ford 2000 scene before winning the closely fought British Formula Three series in 1988. Formula 3000 was a less fruitful hunting ground, but he established a respected Formula One reputation with drives at Onyx, Dallara and Sauber between 1989 and 1993 before landing a seat at Benetton in 1994. JJ broke his neck in a pre-season testing accident and, though he was close to the pace of team-mate Michael Schumacher, the deaths of friend Roland Ratzenberger and Ayrton Senna affected him deeply, and when it was clear that his neck still was not completely healed Benetton dropped him. He raced in the German Touring Car Championship in 1995 and 1996 and then became the world's top sports car driver when leading McLaren's GT attack against the Mercedes in 1997. After a year in Indy Cars in 1998, he returned to sports cars with BMW in 1999, winning the Sebring 12 Hours. He shared a Champion Racing Audi with Johnny Herbert with much success in the American Le Mans Series in 2003.